What is bitter orange peel? What is it used for? Bitter orange peel is the dried outer peel of the highly acidic Seville orange, which is grown and cultivated in Spain, Italy and parts of the U.S. The peel has been found to exhibit cholerectic, anti-inflammatory, antibacterial and antifungal properties. In traditional Chinese medicine, two separate preparations are made using bitter orange peel. Zhi qiao is prepared from the dried peel of a green, immature orange, while zhi shi is prepared from dried fruit. Both forms are used in TCM to treat indigestion and toxic or anaphylactic shock. Bitter orange tinctures and extracts are primarily used as tonics. In Great Britain, bitter orange peel is used to treat heartburn and reduce muscle spasms. It is also thought to facilitate weight gain by stimulating the appetite; however, research into this area remains somewhat controversial. In addition, some studies have found that bitter orange oil may cure certain fungal infections. How much bitter orange peel should I take? The German Commission E recommends 4-6 grams of cut peel per day, which can be used in a tea. Some practitioners recommend taking 1-2 grams of a fluid extract or 2-3 grams of a bitter orange tincture. What forms of bitter orange peel are available? 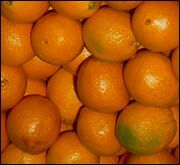 Prolonged use of bitter orange peel may lead some people to become highly sensitive to sunlight, especially in fair-skinned individuals. In addition, it should not be used by women during pregnancy or lactation. As of this writing, there are no known drug interactions with bitter orange peel. What can happen if I take too much bitter orange peel? Are there any interactions I should be aware of? What precautions should I take? Bown D. Encyclopedia of Herbs and Their Uses. New York: DK Publishing, 1995, pp. 262-63. Huang KC. The Pharmacology of Chinese Herbs. Boca Raton: CRC Press, 1993. Pei DK. Dissolution of tetained biliary stones with a compound prescription of orange peel emulsion  a clinical analysis of 134 cases. Chung His I Chieh Ho Tsa Chih 1985;5(10):578, 591-94. Ramadan W, Mourad B, Ibrahim F, et al. Oil of bitter orange: new topical antifungal agent. Int J Dermatol 1996;35(6):448-49. Tang W, Eisenbrand G. Chinese Drugs of Plant Origin: Chemistry, Pharmacology, and Use in Traditional and Modern Medicine. New York: Springer Verlag, 1992.